It’s often been said that there are plenty of fish in the sea. However, if you’re sitting around with an empty line for hours, you start to disbelieve this popular saying. Doing your research on the type of fish you’re hoping to catch well before you jump on the boat can prevent you from coming home with no fresh catches. The team at FishingLicense.org wants all fishermen to be successful on their endeavors, so they encourage enthusiastic fishermen to review tips and tricks and become educated about the types of fish they’re hoping to catch on their next trip. Here are a few of the most popular catches, and some important tips for how to get them into your boat’s cooler. If you’re planning to do some lake or river fishing anywhere in the United States, you might be targeting a largemouth bass. These fish are found in most of the lakes and rivers across the country, and with an aggressive nature, they can be a popular fish to aim for, even for inexperienced fishermen. Since these creatures can grow to be almost 20 pounds at full size, the equipment you use while fishing them will be of the utmost importance. The team at FishingLicense.org recommends only going after these fish with a sturdy rod and thick fishing line, to prevent injury and damage to your fishing equipment. Sometimes, to catch a largemouth bass, all you need is a lure. Since they are so aggressive in nature, they’ll often chomp down on anything they see moving in the water. Fishing for mackerel in the Pacific Ocean is a popular pastime because of the beauty of the scenery, and the abundance of this type of fish. Don’t get discouraged if it takes you a while to hook one of these green-backed fish. They travel in schools, so unless a group is swimming right by your boat or by the dock where you’re located, you won’t be close to snagging one. However, when you’re lucky and a school of mackerel do approach, you’ll probably feel a pull sooner rather than later. These fish aren’t afraid of floating metal hooks or lures, and their curiosity will probably lead you to a bite or two. With the tendency to nibble, it’s important to keep your hook sharp and thick when fishing for Pacific mackerel. If you’re fishing on a river, you may be dreaming about fried catfish for dinner. These fish are known to be bottom feeders, so for a successful trip, you’ll need to sink your lure and hook close to the bottom of the riverbed. The use of a depth finder might be a big help if you’re looking to catch some catfish, so you can figure out where the bottom of the river is and how far your line is from touching. Catfish are also known to be more active in the early morning and in the late evening. The sun’s rays beating down on the river during peak times make these fish scatter to the sides of the water and away from boats. The team at FishingLicense.org recommends you plan your trip in the early morning or late evening. Found in the ocean off the coast of Florida, the Bahamas, and other Caribbean islands, Blackfin tuna is a popular catch because of its edibility. If you’re in search of Blackfin tuna in the open sea, it’s suggested to chum the area you’re in and use white jigs for your lures. 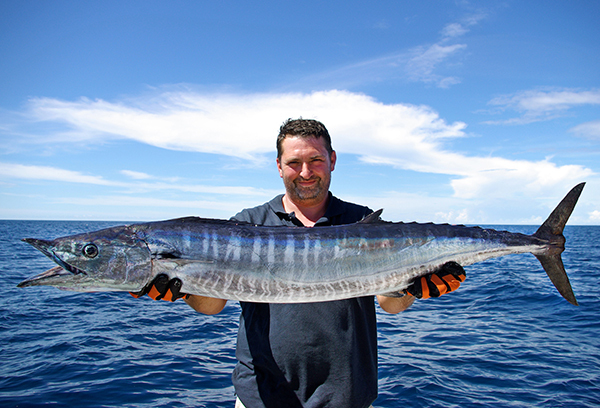 These fish usually weigh between two to 20 pounds in size, and may be caught more easily by trolling. You can also attempt to still fish for Blackfin tuna, but the expert team at FishingLicense.org suggests you use a small baitfish to chum with the whole time you’re out on the prowl. If you’re lucky enough to snag a Blackfin tuna, be cautious of the sharp fins on this fish when you’re handling it, and enjoy your delicious meal.